…children will have an inkling that there’s high-jinks ahead. 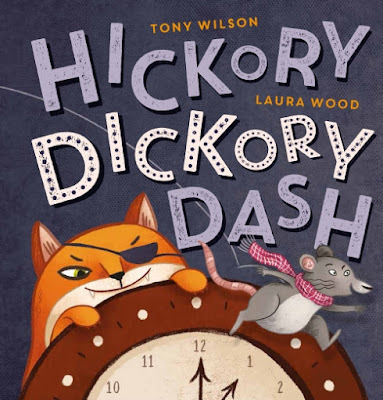 Wilson takes the well known nursery rhyme, Hickory Dickory Dock, and offers a possible explanation for why the mouse ran up the clock in the first place. A complicated and slapstick explanation it is too! I know kids will love the mystery, and especially the way the cat villain gets his just reward. 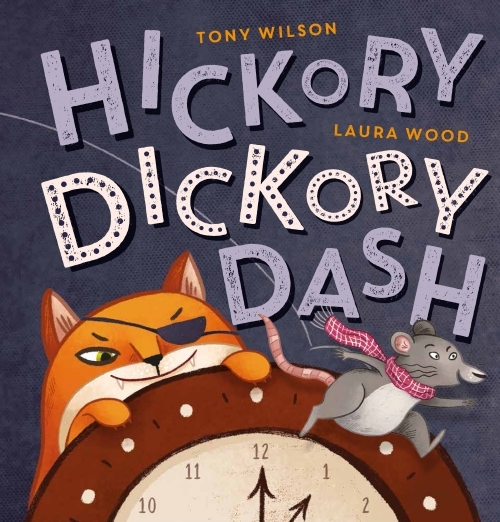 Wood’s quirky illustrations are just the right size for sharing with a group of children, and genuinely convey a wonderful atmosphere of adventure and fun. I loved the emphasis on word play and rhyme in this charming children’s picture book. Children enjoy rhyme, and the book has lots of opportunities for not only joining in with rhyme and repetition, but for innovating on rhymes and making new ones. There are also some great onomatopoeic words like “WHACK”, “CRACK”, “aaaargh” and “SCREECH”, all enhanced with special font so they stand out both aurally and visually. Scholastic have excellent Teacher Notes about the book. Be sure to check out The Book Chook for some activities based on this story that you might like to try with kids during National Simultaneous Storytime. Or anytime!